Good day, fellow home handyworkers! Having some leaking issues with your old dear garbage disposal, aren’t you? I can even tell that you’re here reading this NOT for pleasure, but, in fact, for helpful tips that would help you with that messy situation you’ve got going on. And let me tell you this – here be that much-needed information. With all my knowledge and abilities, I’ll guide you through the whole thing, from diagnosing the problem to mending the unit back to its normal and fully functional state. You’ll get past this in no time. However, I should also say that this is only meant to help you do what we HOMECOOKS could do to mend a leaking disposal machine, not professionals. If something is not mentioned, it probably is a matter for the experts. Meanwhile, let’s do what we can before sending for them, shall we? Might as well since you’re already here! And do leave a comment or something to let me know if this were useful at all. That would help me alot. Thanks! Let me be frank here, the concept is nothing complicated. It leaks mainly because of weak seals. So to deal with leaks is to find the exact location(s) and find the way to secure the seal this time around. If you’re also having other problems with your machine, take a look at our article on the matter. You may find something. Ah, I forgot! There’s another thing that’s worth mentioning: preventive steps. To fix leaks, the best way is to not have them at all. So, when a unit is first installed, pay some extra attention to the connections. You can take care of it yourself or ask the plumbers to be thorough. First off, we have to look at the potential spots closely in order to get a hold of the situation and make sure of the number of leak points. Once you’ve done that, we’ll talk about what can be done to help better keep the fluid within its supposed tract. This is the core of the whole repair so be mindful, and I recommend that you take this into your own hands. Because by doing so, you can also determine the current condition of your unit, and decide whether to go for a fix or a replacement instead. The sinkhole should be the number one suspect whenever leaking is spotted. 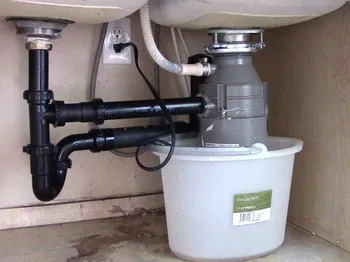 Due to the design, the mount assembly of garbage disposals is likely to have people confused and leads to it being set up the wrong way, especially when one tries to install the unit by themselves for the first time. That being said, it’s only as complicated as you are inattentive. Be a tad extra careful and everything should be alright. Back to dealing with the problem. If it leaks there, there’s a big chance that the seal is not secure any longer. You’ll have to remove the machine and the mount assembly, and set it in place correctly this time. If the provided rubber gasket was used to seal the flange the first time, remove it and use plumber’s putty instead. If putty was used, don’t go easy on it this time. Excess putty can be retrieved and reused. Remember to clean the sinkhole off debris first. Refer to the guide sheet(s) to make sure of the number as well as the order of gaskets onto the underside of the sink. Check if the sink itself isn’t punctured in anyway. If it is, call for professional services. The second most likely spot for a leak is the wastewater outlet of garbage disposals. There are two reasons why this joint is prone to leaking: 1) the first installation was somewhat wrongfully done, 2) the vibration of the machine has compromised the dignity of the joint or the elbow pipe itself. To handle the situation, first we have to see whether it’s something repairable. If there’s nothing too serious, we need to readjust the joint for a better connection. Try using a screwdriver to check if the bolts are tight enough and see if that fixes it. If it still leaks, remove the elbow piece and put it back properly. Check if the elbow pipe is cracked. If it is, buy a replacement. It can’t be fixed, not properly. Disconnect the subsequent pipes from the elbow piece for easy removal of the elbow piece. When putting the piece back, make sure that the rubber gasket is in place. Don’t fasten the bolts too tightly to avoid damaging the parts. Snug is good enough. The food waste disposer inlet is designed to receive the outlet from the dishwasher. It’s a fairly basic and standard connection that hardly anything can go wrong. And if there’s something, it’s usually an easy fix, unless the inlet port is cracked. If it’s indeed damaged, you’re advised to send for professionals. Use a (soft) tube/hose of the right size. Refer to specification sheet. Always use a hose clamp and not to overtighten it to avoid any damage on the port and the hose. If the leaking is from none of those above, but instead from the bottom of the machine itself, that means the internal seals are all burst up. It usually occurs due to old age, expected after 5 to 10 years of usage. In case your unit is ACTUALY so old that it leaks, contacting professionals for repair and opting for a new unit are are the two optimal options. I, myself, suggest going for the latter. After all that time, the old “dude” deserves to rest. Sometimes it also happens to new yet faulty machines. To prevent that, one should choose a trustworthy brand. There are quite a few of them, but it should not be too difficult. Off the top of my head, Insinkerator and Moen are two reputated companies. The quality of their products rarely dissapoints.